Dental implants are typically made of titanium and are similar in shape and size to a natural tooth root. Titanium is the material of choice for dental implants due to its strength, durability and its ability to fuse to bone over time. The process of the bone fusing to the implant's surface is called osseointegration. The bone cells attach themselves to the implant during this period of healing. A dental implant, also called an endosseous root-form implant, is a man made replacement for a tooth root. Dental implants are ideal for patients who have missing or compromised teeth due to periodontal disease, decay, injury or for those who have congenitally missing teeth. They can be used to replace a single tooth, multiple teeth or an entire upper and/or lower jaw of teeth. Because implants are placed in the upper or lower jaw, it's important to determine the exact dimensions of a patient's existing bone, and identify important anatomic landmarks such as nerves and sinuses before placing the dental implants. Your Hybridge provider will take a CT scan, which is a 3-D image of the teeth and jaw, and will assess both the width and depth of existing bone. If there is not enough bone available, it may be necessary to add bone grafting material, which typically consists of "mineralized, freeze dried bone" that will heal and transform into newly grown bone. This is sometimes necessary in the area of the sinuses and involves adding bone below the sinus, creating enough bone for the implant to be placed. This process is called a sinus augmentation. Dental implants are inserted in the jaw during the surgical phase of the dental implant treatment. 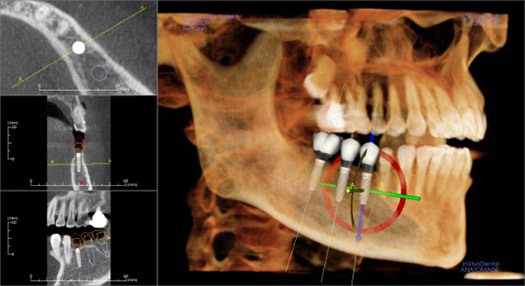 Today, technology allows for exact positioning and safety during the placement of implants, and is guided with the help of computer assisted dental planning software and surgical guides. In most cases, healing times range from 3 weeks to many months, depending on the condition of the bone in the jaw. The need for bone grafting requires more healing time than when bone augmentation isn't necessary. After an appropriate healing period, determined after the placement of the implants, an impression will be taken and the final crown(s) or bridge fabricated. 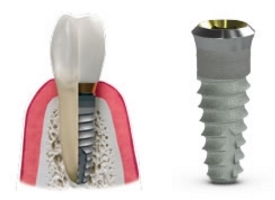 An abutment will be attached to the implant and the final crown or bridge cemented to the abutment. The success rate of these endosseous implants is greater than 95%. Success is typically defined as a healthy, functioning implant for at least a 10 year period. Implants should be expected to maintain their health and function for many more years than that. If you'd like to learn about whether an implant supported restoration would be an ideal solution for your dental needs, contact your Hybridge provider today for a screening and consultation appointment. What are the steps to replace a single tooth with a dental implant? Chris' front tooth was damaged in an accident many years ago. In this video you'll learn the steps we take to replace a broken tooth with a dental implant, and you'll see how this patients smile was fully restored with a single dental implant tooth. Find a Certified Hybridge Dental Implant Doctor.